photo appears as old print in album B. This photo appears as a lithograph on p.21. of N.H. Chittenden's "Queen Charlotte Islands Exploration" Maynard was official photographer on the trip. 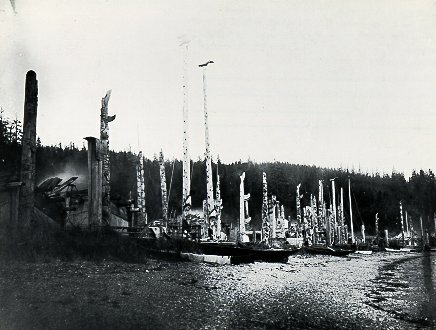 This picture was titled:"The Indian Village of Skidegate." published 1884. E396 (PN16) is a blow-up portion of this photo. SEE AS WELL : Pn16038-TAKEN AT SAME TIME.